Detroit PAL Grand Opening Weekend! The weekend of March 23rd 2018 will never be forgotten. Detroit PAL opened up its new facility to the public and there were a series of events from Friday-Sunday that brought people from all over metro Detroit to The Corner Ballpark presented by Adient. Local news and newspaper outlets came to witness the new home of Detroit PAL on the corner of Michigan and Trumbull. The site where the Detroit Tigers played their homes games will now host youth from around the metro Detroit area. Saturday was a fun filled day as Detroit PAL had its grand opening of its new facility. The festivities kicked off at 9 a.m. with a parade of youth in the PAL organization walking around the Willie Horton Field of Dreams for the first time, with Detroit PAL’s COO Robert Jamerson leading the way. After the parade, a list of speakers talked to the crowd headlined by PAL CEO Tim Richey, Detroit Mayor Mike Duggan, Detroit Police Chief James Craig and former U.S. Sen. Carl Levin. Caidon Haliburton, last year’s PAL Youth of the Year and Lea Caldwell, 2018 PAL Youth of the Year both spoke to the crowd and told them how much this new facility meant to them and the youth. 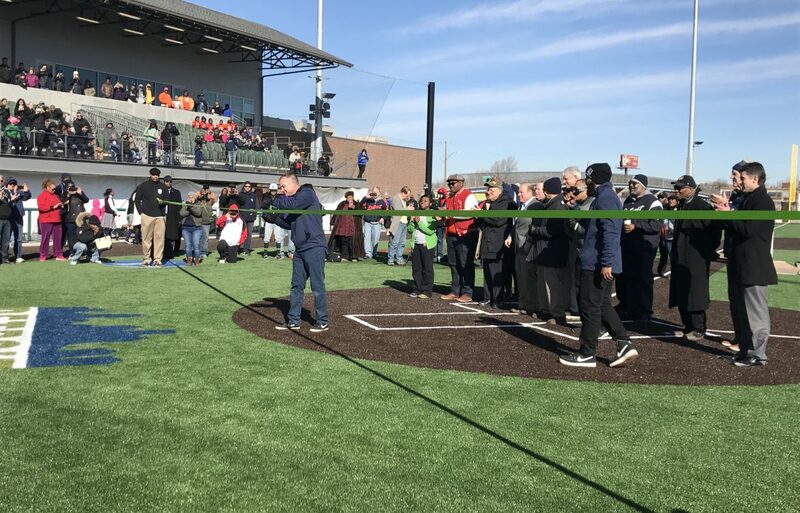 When the speakers were done, Tim Richey did the ceremonial ribbon-cutting on the field and just like that, The Corner Ballpark presented by Adient was open! A special thanks to the Detroit News as 16 Metro Detroit youth were introduced as finalists for The Detroit News/Detroit PAL First pitch essay contest. Eight winners were announced by Detroit’s own Dr. Darrius of 97.9 WJLB. Those winners had the opportunity to throw out the ceremonial first pitch and in addition to that, each winner will receive a personalized brick to be placed at The Corner Ballpark presented by Adient entrance, which will be there for years to come. After the winners threw out the first pitch, it was time to play some baseball. Following the first game were two high school games that featured two Detroit schools facing off against two suburban schools. Detroit King played West Bloomfield and Detroit Western played Saline. Fans were enjoying the baseball games as well as touring the new facility. A beautiful site to see when the kids and adults had the opportunity to run the bases on the field and experience the new all-turf field. The Willie Horton Field of Dreams presented by Meijer will host baseball, softball, Tiny Tigers, soccer, cheer, football, and more. Visitors left The Corner Ballpark presented by Adient on Saturday with a smile on their faces. On Sunday, Detroit PAL hosted a Corktown Market for local businesses to come in and share information with visitors.